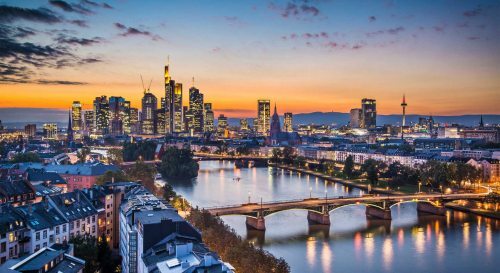 Condor Airlines is showing some well priced flights from Victoria to Frankfurt, Germany in October for $597 CAD roundtrip including taxes. The flights have 1 stop each way in Vancouver. The price of the flights will show up as $548 CAD on Condor.com, but it will really end up costing $587 CAD, because Condor bills your credit card in Euros, which means your credit card company adds 2.5% to the transaction (and annoyingly, Condor doesn't mention this during the booking process). This will start you with a search from Victoria to Frankfurt, Germany. 3. Scroll down to the return flights. Look for the return dates that are $255 CAD. flight deals, europe, frankfurt, germany, fra, central europe, western europe, victoria and yyj. 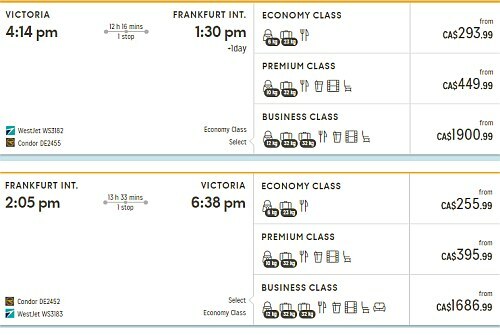 3 Responses to "Victoria to Frankfurt, Germany - $587 CAD roundtrip including taxes"
Can one board the plane in Vancouver instead of Victoria? Same on the way back ... can I just get off the plane in YVR instead of having to go all the way to Victoria? Unfortunately not. All airlines will automatically cancel the remaining legs on a ticket, once one leg is intentionally missed. So, on the way home, you could get off the plane in YVR and leave the airport (as long as you don't have checked luggage that would continue on to YYJ). But on the way there, you would need to start in Victoria.